Welcome to Day 2 of The Comics Cube! 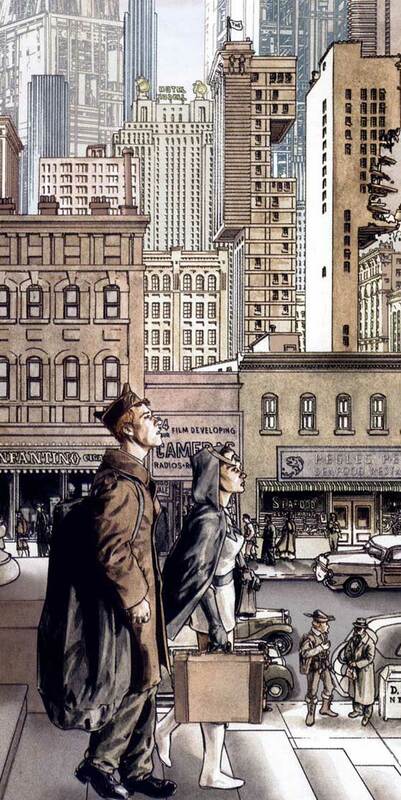 's retrospective series on America's Best Comics. You can read about this series here. Today, we focus on TOP 10, by Alan Moore, Gene Ha, and Zander Cannon! Of all the retrospectives, this one is the hardest for me to write, simply because I'd already written it before when I was recommending comics for Christmas, so it's hard to tackle this from a different angle. But here goes. 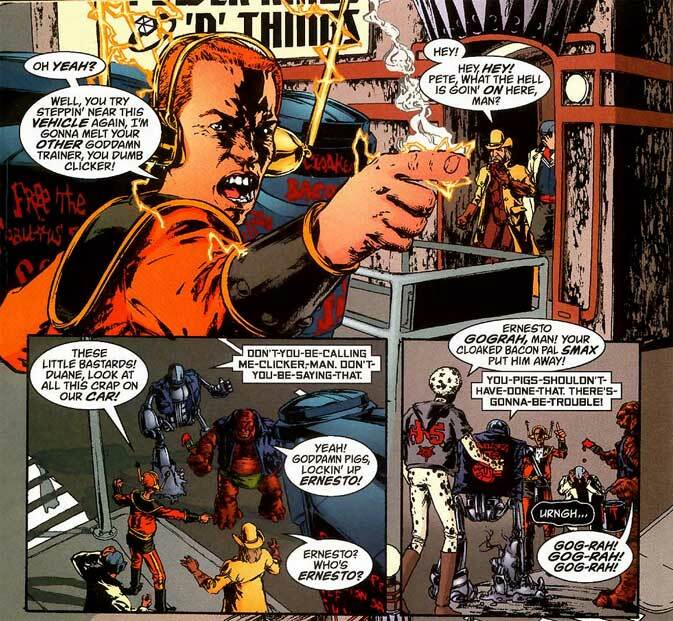 In 1949, after World War II, everyone with superpowers was assigned to the city of Neopolis, since the regular citizens wanted nothing to do with them anymore without some bad guys to fight (some metacommentary right there). 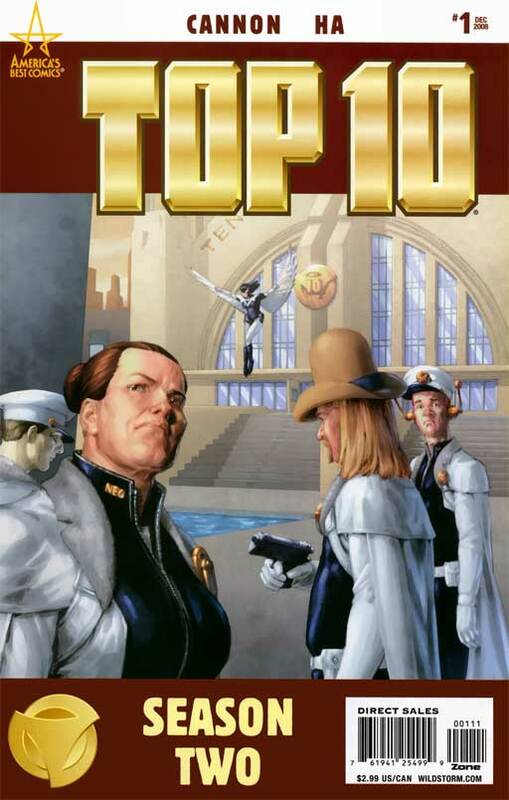 So the city developed, and the local police precinct was called Precinct 10, colloquially called Top 10. Now in the present day, the officers all have special abilities and superpowers. 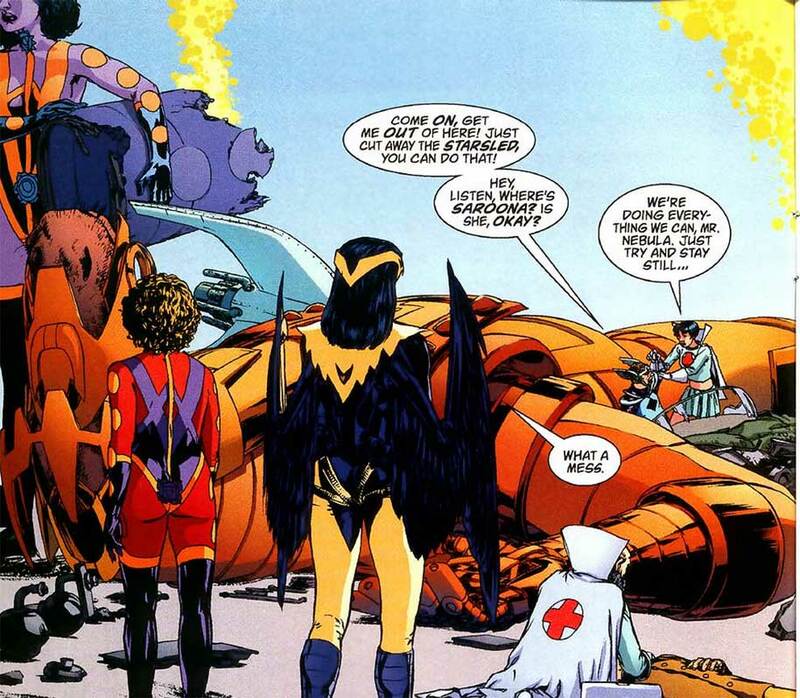 They include Smax, a big, blue grumpy guy who is their heavy hitter; Robin "Toybox" Slinger, who has a, uh, box of toys that she controls remotely and are capable of a wide variety of effects; Jack Phantom, a lesbian with the ability to phase in and out of solid objects; and King Peacock, a black Satanist who is able to detect weaknesses of various objects. 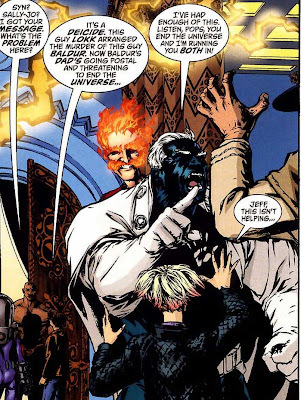 The recognition of those last two characters being representations of minority groups is important, because it gives off the impression that Neopolis is a progressive and accepting city. On the contrary, there is in fact an ostracized minority group — the Ferro-Americans, known to us as robots, and known, derogatorily, as clickers. Instead of producing "rap" music with their "homes," these robots produce "scrap" music with their "ohms." This correspondence is never explicitly stated in the text, but it's this kind of thing that makes Neopolis feel just as real as the real world, albeit with far different and more fantastical trappings. The strength of TOP 10 lay completely in the strength of its characterization. When you think of group books in superhero comics, you tend to think of the characters in terms of their powers and their costumes (Thor is the guy with the hammer, the Flash runs fast, Cyclops shoots beams from his eyes), and this isn't true with Top 10. While yes, you are aware that Smax is the powerhouse and Robyn Slinger has the remote-controlled toys, they're primarily the grumpy guy and the spunky rookie. 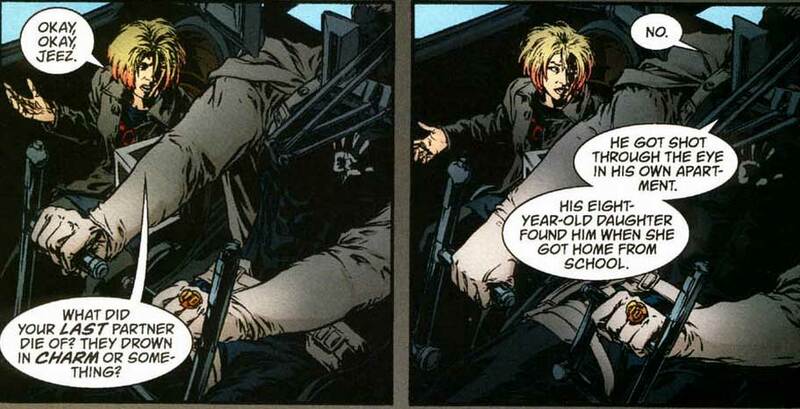 This two-panel scene with Dust Devil and Shockheaded Peter illustrated one of Gene Ha's strengths, which is the ability to really draw all sorts of emotions. A lot of artists seem able to draw only the basic emotions (happiness, sadness, etc. ), but in the second panel there, Gene is able to depict the type of regret where the character feeling it isn't sure if he should be feeling it. There are multiple plots in TOP 10, as Moore, admittedly influenced by cop shows such as NYPD Blue and Hill Street Blues, adopted an episodic, ensemble approach to the series. So there aren't many scene cuts that go "Meanwhile, back at the ranch--", but rather, it's a natural flow of events wherein one character exits an area as another enters to further another subplot. The result is a very organic and very fluid book. The book starts off with two main cases. 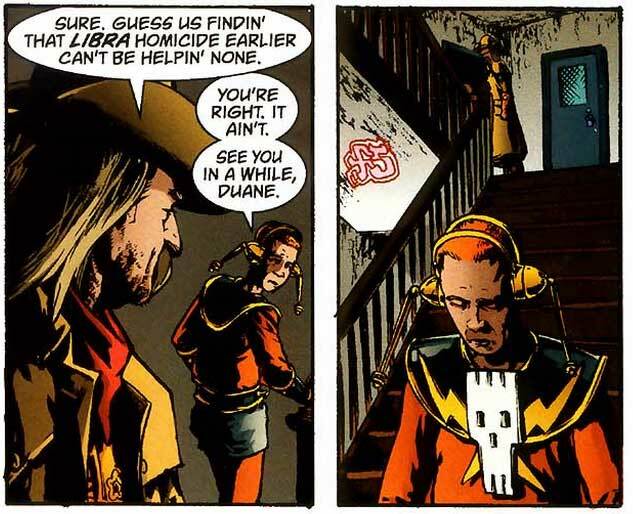 The first has to do with the murder of Stefan Graczik, who has to do with dealing drugs, and the other is the pursuit of the Libra killer, a being who has been decapitating prostitutes periodically over the years. 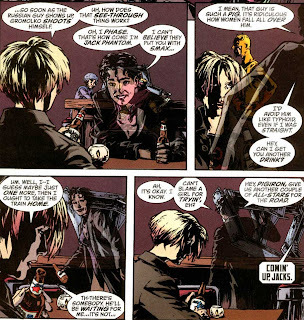 These two plotlines don't come together in the end — they weren't supposed to, after all, since the series was conceived as a finite series, but rather an ongoing serial — but that's okay, because the entire book feels connected very tightly as it is, as various police officers switch cases and partners depending on what is best. Along the way, there are a lot of other, smaller cases that the officers have to deal with. For my part, the two best issues focus on these smaller cases. 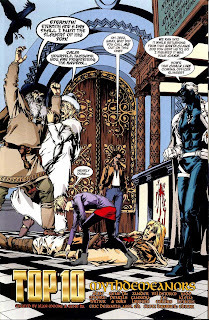 The first one is in issue #8 (found in Book 1), where the officers go into a bar called "Godz," and they have to solve the murder of Baldur, a Norse God. Those familiar with the story of Balder's death would be especially amused, since the entire thing is treated like a police procedural, but even those who don't know anything about it would simply be reading a very well-done story that is carried by the characterizations of the officers, as depicted and conveyed expertly by Ha and Cannon. It's fun and at points silly, but the storytelling plays it straight, and that's really what makes it work. And believe me when I say that the ending of the story is going to kick you in the rear. In a good way. The other highlight of the series is in issue #8 (available in Book 2), where Lieutenant Peregrine has to investigate a teleportation accident. 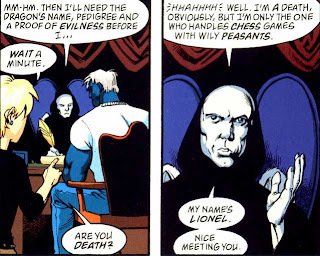 I'm not gonna post any of the pivotal panels from it, because it would ruin the entire story if I did. But suffice it to say, it's one of the most legitimately moving short stories I've ever read in fiction, capable of inducing tears, accelerating your heartbeat, and enticing you to read it at least two more times. It wouldn't be right to talk about what makes this series work without talking about its many easter eggs. 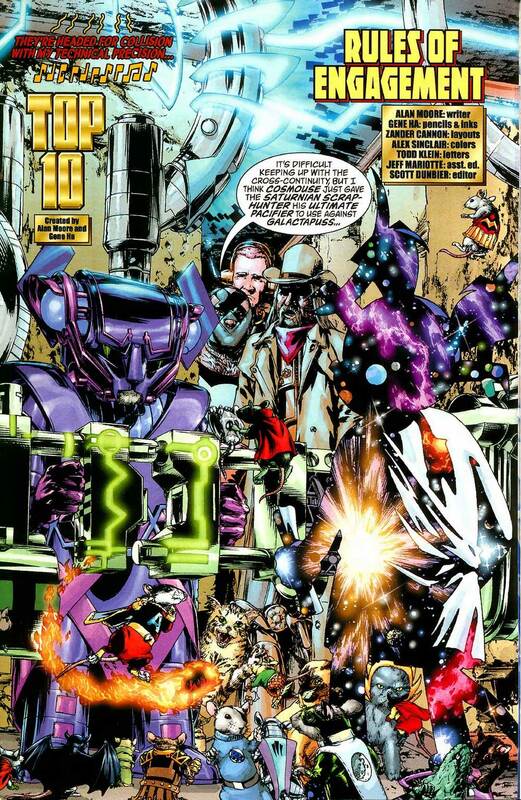 TOP 10 doesn't do much in the way of fancy layouts — that's for another in the ABC line — but it does utilize a trick that Harvey Kurtzman popularized and Moore and Dave Gibbons used to great effect in WATCHMEN, and that's just packing as much as you can in a panel. (Kurtzman called it sight gags, and Moore calls it sight dramatics. The only difference is really in the intended effect.) 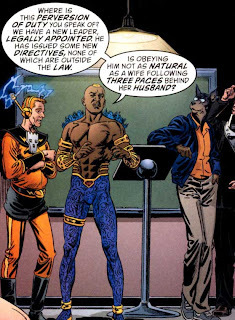 With these sight dramatics, Moore, Cannon, and Ha are able to answer many questions about Neopolis. 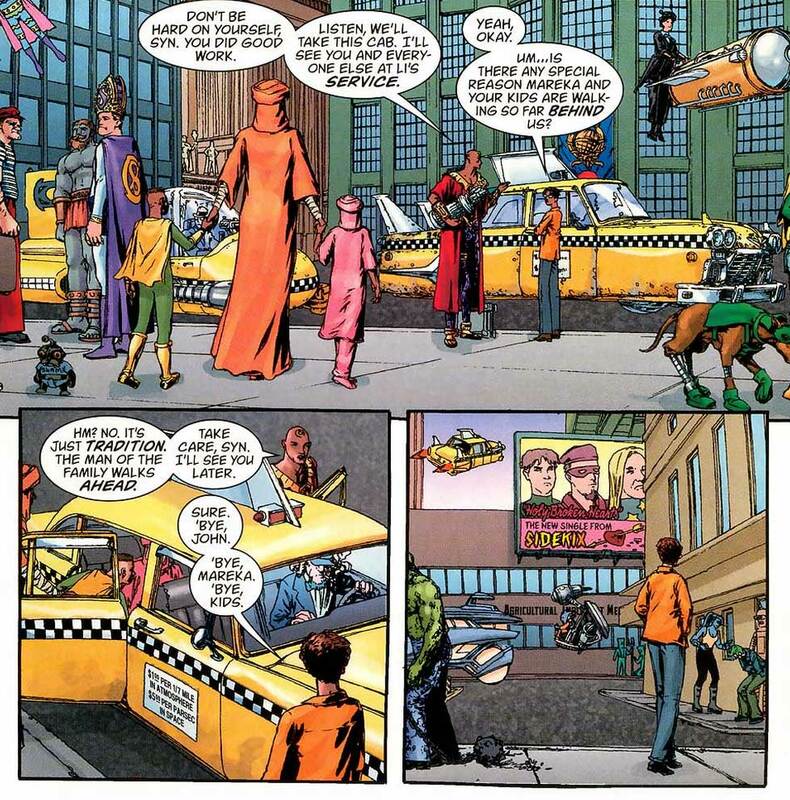 What kinds of comics do they read in a city full of superheroes? What kinds of bars are there? What does a speedster do for a living? Check out the first panel of the first issue alone. The ads in the train go a long way into developing the city. 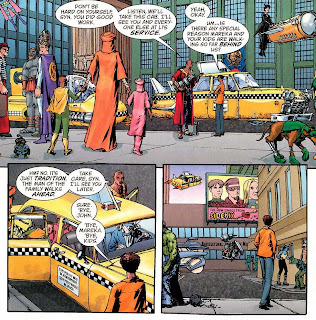 Click here for the full annotations for this panel. The result is that the book really makes you take in every single inch of every single panel of every single page of every single issue. 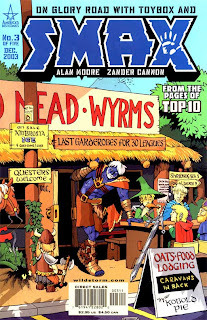 You really read the pictures as much as you read the words, and perhaps it's because of this that I've always found TOP 10 to be, without exaggeration, the absolute best comic to give to people who do not read comics. The prevalent theory is that these people are not used to examining both the words and pictures, but TOP 10, more than any other comic I've ever encountered, is told in such a way that you absolutely, unequivocally have to examine both. And for those who do, the story and the characters truly, really come to life. 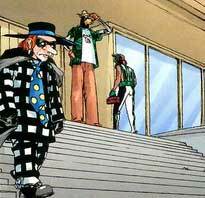 TOP 10 also gives you easter eggs in the form of familiar faces, drawn by Gene Ha to fit into the world and style of Neopolis. Here's the Hamburglar exiting the precinct, presumably just released for his crime of stealing a bunch of hamburgers. And in this scene from an alternate reality Neopolis, you see a bunch of Roman-themed characters, such as Marvin the Martian, his dog, Asterix, and Obelix, changed to suit the TOP 10 style. Marvin the Martian and his dog and Obelix are visible. You may have to zoom in to see Asterix. Points if you name the other characters. There are more — Buffy the Vampire Slayer, The Powerpuff Girls, the cast of Futurama, evil Cartman from South Park, various iterations of Spider-Man, a literal Doctor Octopus — but to close off this section, I present you with a major crisis of epic proportions — as done with superpowered mice and cats. I see Danger Mouse and Mighty Mouse. Who'd you got? After the first series of TOP 10 (affectionately called "Season 1"), Moore and Cannon released SMAX, which focused on Smax, accompanied by Toybox, returning to his world, a land of fantasy and magic. Smax absolutely hates this world, but he has to undergo a quest to kill a dragon named Morningbright. He's accompanied by Toybox, three dwarves (his cousins [Smax is adopted] — wait till you see what role-playing game they play), an elf, and his sister, who he has romantic feelings for (it's normal there). Also, he has a sword that likes to break into song. And has a preference for 70s disco hits. If that doesn't sell you on the series, you're devoid of fun. The story's got more of a comedic and lighthearted tone than the main TOP 10 series, but that's perfectly in keeping with Cannon's more lighthearted and cartoony style. And dude, it has Winnie the Pooh in one panel. You kinda can't lose. 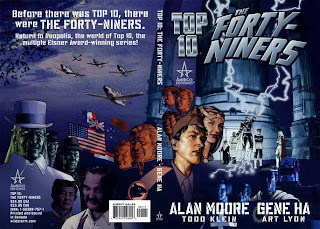 In contrast, Moore and Ha's original graphic novel, THE 49ERS, was a complete 180 from SMAX in terms of tone, being more serious. (One wonders if it's the combination of Cannon and Ha that gave the original series its more balanced tone.) This book takes place in 1949 at the beginnings of Neopolis, and focuses on Steve Traynor, Jetlad, who in the main series is Captain Traynor, Jetman. The book is somber, mostly muted, and poetic, and this is conveyed perfectly by Gene Ha's wash-tone artwork. 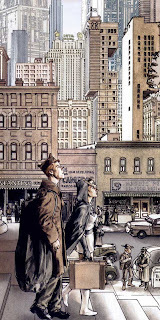 Traynor and his friend Leni "Skywitch" Muller's problems with fitting into this new world and this new city are plentiful, and like the other two series, the book is carried by characterization. And of course, there's no shortage of Easter Eggs. Click here to unpack this panel. I can't recommend THE 49ERS and SMAX enough. Unfortunately, I can't say the same thing for the TOP 10 comics that Moore had nothing to do with. 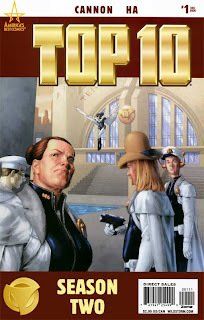 Paul DeFilippo and Jerry Ordway did a spinoff called TOP 10: BEYOND THE FARTHEST PRECINCT. It was horrid. 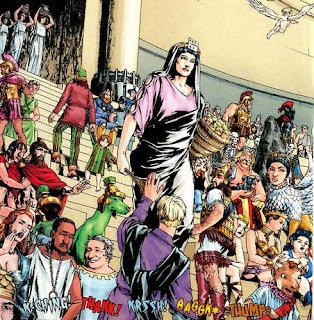 I highly respect Jerry Ordway, as he was one of my favorites when I was a kid, but this series just did not have the subtlety or the deft characterization that Moore gave to these people. For example, in the main series, Moore wishes to introduce King Peacock's Satanist principle of having the wife walk some paces behind the husband, and this is how he does it. Spot Dynomutt, Mary Poppins, the Futurama crew, and Superman in his Pope hat. Ordway also doesn't, for whatever reason, use Ha's method for the Easter eggs. Instead of redrawing everything to fit one style, he redraws all the tributes and homages in their original styles. 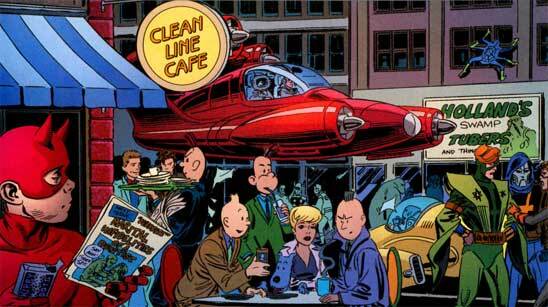 Check out the panel below and the homage to Tintin. The result is more parody and a hodgepodge than anything else. Fortunately, BEYOND THE FARTHEST PRECINCT takes place five years removed from the original series, so we can ignore it. More tragic than that is the next spinoff. In 2008, Zander Cannon and Gene Ha came out with TOP 10: SEASON TWO, which takes place soon after the main series. I can't vouch for the series' quality, as I've never read it, although I'm not happy with the art style Ha and Cannon used to approach this series. I'm a big fan of line art (meaning black inks), and this digital painting thing doesn't work for me. But that may just be me being a fogey. Part of the reason I haven't read it is simple: because it doesn't end. 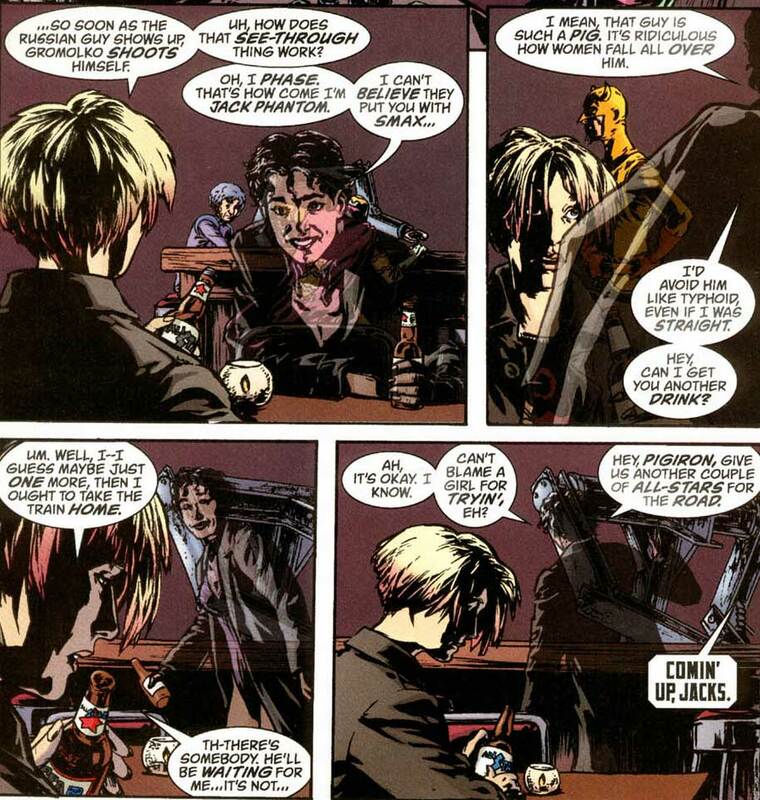 DC had commissioned Ha and Cannon to do two four-issue miniseries, which would read together as a big story. Unfortunately, by the end of the fourth issue, the sales weren't enough, so they discontinued the request for the second series. Perhaps if enough of the trades are moved, they might recommission it, but I can't see people wanting to buy it knowing it doesn't end properly. Despite the sad nature of those two spinoffs, the TOP 10 franchise holds a spot near and dear to my heart. It's the comic I've continually used to get people who don't read comics to read comics, and the characters feel real enough to me, and the stories from the original series and the Moore-written spinoffs really resonate. I wish they could do more with this property, and I wish they could finish Season 2. 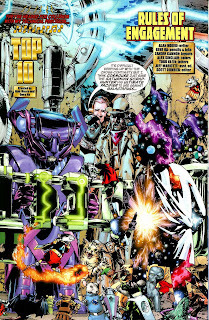 I'd love to see George Perez take a crack on the art duties if ever Gene is too busy, for example. 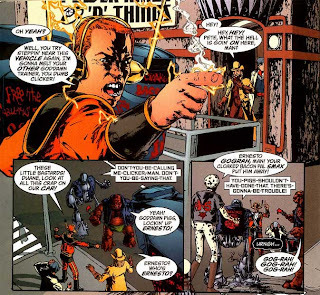 I think there's just such a gigantic treasure trove that is untapped in this property, and I continually say that if DC ever really wanted to capitalize on Alan Moore's name, they really should just re-release the original series and market it to the high heavens. I firmly believe that given the right push and the right support, this book would have gone down in history as a trendsetter and a landmark. But hey, multiple Eisner Awards will do. For those of you who want a guide to TOP 10's many Easter Eggs, check out Jess Nevins' annotations right here. The issue with the teleport crash still gives me goosebumps everytime, just by thinking about it. And the impact is probably just as powerful even if it's the only Top 10 issue a reader has ever read.